The Strahman M-5000TG mixing unit produces hot water instantly from a steady supply of steam and cold water. All mixing stations are equipped with a dial type gauge that indicates the wash waters exact temperature . 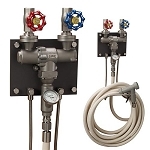 Users can easily regulate by turning the units steam and cold water valves. As an added safety measure, these units shut off their steam source automatically if the cold water side falls below 50 psi. This unit is available in three ranges depending on your pressure. 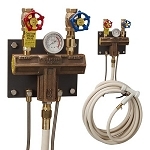 Low Steam = 80-95 psi, Medium Steam = 96-130 psi, and High Steam = 131-150 psi. Standard unit will be supplied with low steam, please indicate if you need Medium or High at checkout (prices are the same). 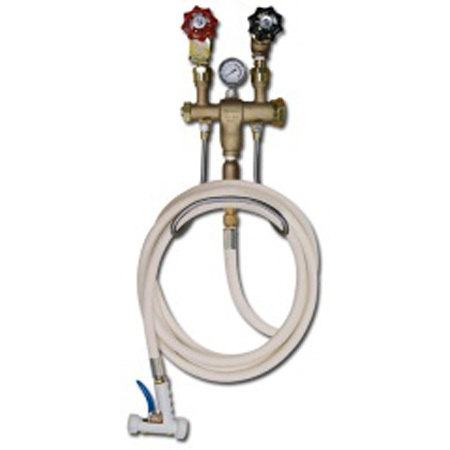 Optional hose adder will be for an “A-X” hose assembly — high pressure homoflex PREMIUM WRAPPED hot water hose with ¾” Male NPT fitting on unit end and 5/8 Swivel Adapter on the other (user) end, M70 Nozzle included. Standard hose color is black. Please indicate if you want white or red at checkout.